Note: I got this from a friend on the geek. This page is nice, But I recommend reading the pdf version. You can also go to the Bottom of this page and click on files to get the file. 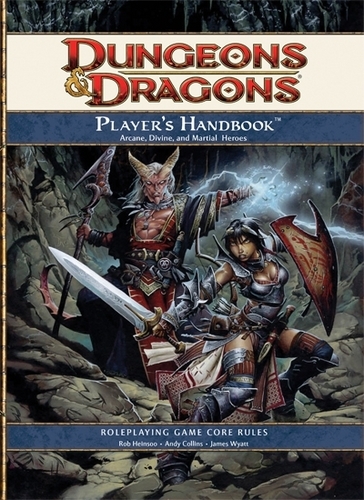 At its heart, the D&D game uses a core game mechanic. It all resolves around task resolution. Compare your total result to the Target Number. If your result is equal to or higher than the necessary number, you succeed at your task. If your result is lower, you fail. There’s a little more than that, but this core mechanic governs almost all D&D gameplay. Key examples of the core mechanic in play will follow. Along with the Core Mechanic, three basic principles should be remembered. Other rules in the game are based on these assumptions. Simple Rules, Many Exceptions: Every class, race, feat, power, and monster breaks the rules in some way. From minor to significant, the game is built upon exception-based rules design. For example, a normal melee attack always deals a few points of damage, but every class has powers that ramp up the damage when they get used. Specific Beats General: If a specific rule contradicts a general rule, the specific rule wins. For example, you normally can’t move as part of a regular attack. But if you have a power that allows you to move-and-attack, that specific rule trumps the general rule – when you use that power. Always Round Down: When the game asks you to divide a number, such as when you add half your level to your attack roll, you always round down to the next lower whole number. When you use a skill, you make a skill check. The higher the result, the better. Your result is compared against a Difficulty Class, or DC (a number set by the DM, based on the situation) or an opposed check made by a character opposing your use of the skill with another skill of their own. When you make an attack, either using a basic attack or a Power, you make an attack roll. The higher the result, the better. The result is compared to the target’s defense score. Different attack types are compared against different defense scores. Characters and monsters have four different defenses: Armour Class (AC), Fortitude, Reflex, and Will. The action in D&D takes place in encounters. In encounters, all characters have something to do, and its important for them to work together to overcome whatever challenge is set before them. Outside of encounters, characters explore their environment and engage in social interactions. When exploration or social interaction involves serious consequences for success or failure, it becomes an encounter. Encounters come in two basic forms: combat encounters and noncombat encounters. Fighting Monsters. What D&D adventure would be complete without combat encounters where characters rely on attack powers, skills, feats, and magic items to battle hordes of ravenous creatures or evil villains? Combat encounters break out when the player characters run into an opposing force. That force could be a powerful solo monster, a group of terrifying creatures, or a gang of villainous nonplayer characters. The chaos of combat is organized into a cycle of rounds and turns. Round: In a round, every combatant takes a turn. A round represents about 6 seconds in the game world. Turn: On your turn, you take actions in any order you wish (see “Actions” below). Establish Positions: The DM decides where the combatants start out on the battle grid. The DM shows the players where they can set up their characters and then places the monsters. Take surprise round actions: If any combatants gained an initial surprise round, they act in initiative order, each taking a single action. End the encounter: After one side or the other flees or is defeated, the encounter ends when the remaining side takes a short rest, or an extended rest. Standard Action: You can normally take one standard action on your turn. Most attack powers require the use of a standard action. Move Action: You can normally take one move action on your turn. Walking your speed-value requires the use of a move action. Free Action: Free actions take almost no time or effort. You can take as many free actions as you want during your (or another combatant’s) turn, as allowed by the DM. Free actions include speaking short phrases, or dropping a held item. There are two additional action types that require triggers before you can use them – an action, event, or condition that takes place on another combatant’s turn. Opportunity action: When an enemy lets its guard down, you can take an opportunity action. You can only take one opportunity action on each combatant’s turn (if available). An opportunity action interrupts the action that triggered it. The most common opportunity action is an opportunity attack. When an enemy leaves a square adjacent to you, or when an adjacent enemy makes a ranged or an area attack, you can make an opportunity attack against that enemy. Immediate Action: Interrupts and reactions are immediate actions. Specific powers define the trigger for these actions. You can only take one immediate action per round, and you can’t take an immediate action on your turn. An interrupt lets you act before the triggering action is resolved. If the interrupt invalidates the triggering action, that triggering action is lost. A reaction lets you act immediately in response to a triggering action. The triggering action is completely resolved before you take your reaction. On your initiative order, you take your turn. Your turn has three parts: the start of your turn, actions on your turn, and the end of your turn. The Start Your Turn: Before you act, use the start of your turn to keep track of any effects. Ongoing Damage. If you’re suffering ongoing damage, take damage now. Regeneration. If you have regeneration, you gain hit points now. Other Effects. Deal with other effects that occur at the Start of your turn now. Actions on Your Turn: You get three actions to perform on your turn. Any Order. You can take your Standard/Move/Minor actions in any order, and can skip any of them. Substitute Actions. You can take a move action or a minor action instead of a standard action, and you can take a minor action instead of a move action. Other Combatant’s Actions – Other combatants can take free action on your turn, and you might take actions that trigger immediate actions or opportunity actions from other combatants. The End of Your Turn: After you act, use the end of your turn to keep track of any effects. Saving Throws. You can now make a saving throw against each effect that may be ended with a save. Roll a d20. If you roll under 10, the effect continues. If you roll 10 or higher, the effect ends. End Effects. Some effects end automatically at the end of your turn. No Actions Allowed. You may not perform any actions at the end of your turn. If you successfully attack an enemy with a basic attack or Power, you deal damage. Roll the damage dice as specific on your Power Card. Damage reduces a character’s hit points. When you roll a 20 on the die when making an attack roll, you score a critical hit. Instead of rolling damage, you deal the maximum amount of damage possible for the attack when you score a critical hit. Flanking provides a simple combat tactic for you and an ally to use against an enemy. To flank an enemy, you and an ally must be adjacent to the enemy and on opposite side of the enemy’s space. You and your ally must be able to attack the enemy (with a melee or ranged weapon, or unarmed attack). If there’s a barrier between your enemy and either you or your ally, you don’t flank. If you are affected by a condition that prevents you from taking actions, you don’t flank. When a defender can’t give full attention to defense, it grants combat advantage to its attacker. This usually occurs when the defender is flanked, stunned, or otherwise caught off guard. You must be able to see a target to gain combat advantage against it. This section describes how to perform some of the most common actions available on your turn. Basic Attack: As a standard action, you can make a melee basic attack, or a ranged basic attack. Charge: As a standard action, you can launch yourself forward and make a basic melee attack. Move your speed as part of the charge. At the end of the move, you make a melee basic attack with a +1 bonus to the attack roll. You must move at least 2 squares from your starting position, and you must charge to the nearest unoccupied square from which you can attack the enemy. Charging provokes attacks of opportunity. After a charge, you can’t take any further actions unless you spend an Action Point. Second Wind: As a standard Action, you can spend a Healing Surge to regain hit points. When you do, you regain one-quarter of your maximum hit points (round down). You also gain a +2 bonus to all defenses until the start of your next turn. You can use your second wind once per encounter. Readying an Action: You may ready an action (move, standard, or minor) by stating the trigger event, and postponing the use of your action. You may ignore the trigger once it occurs, but if you choose to trigger your action, take it as an immediate reaction. Immediately after, reset your initiative marker to the new (later) spot in the initiative order. Therefore, you can ready a standard action to the movement of an enemy, using it to interrupt the enemy’s turn with a readied attack. This attack interrupts the enemy’s movement, happening before your enemy’s own attack happens. Pick any corner of your square, and trace a line to any part of the target square. If that line doesn’t pass through any object or vision-impairing effect or obstacle, you have at least some line of sight, and may attack. To determine if that line of sight is clear, trace from your square’s corner to each of the target square’s corners. If at least one or two lines pass through an obstruction, the target has cover (for hard objects) or concealment (for vision-impairing effects) and suffers a -2 to hit. If at three or all four lines pass through an obstruction, the target has superior cover (for hard objects) or total concealment (for vision-impairing effects) and suffers a -5 to hit. Enemy figures provide cover for enemy figures. Allies never provide cover for enemy figures. However, neither allies nor enemies will ever give you cover against close, or melee, or area attacks (but still grant cover against ranged). Melee attacks with reach which stretch through terrain which grant cover are treated as if the terrain still granted the cover bonus. Concealment effects only impact melee and ranged attacks, not area or close attacks. You can use a move action to walk your speed in a turn. If you use two move actions (substituting a move for a standard action) you can walk twice your speed on your turn. Shift. Move 1 square without provoking opportunity attacks. You can’t normally shift onto difficult terrain. Run. Move up to your speed +2 squares, and grant combat advantage to enemies by doing so. Certain powers and effects allow you to pull, push, or slide a target. Pull: when you pull a creature, each square you move it must bring it nearer to you. Push: when you push a creature, each square you move it must place it further away from you. Slide: when you slide a creature, there’s no restriction on the direction you may move it. The following rules govern all forced movement. Distance. The power specifies how many squares you can move a target. You can choose to move the target fewer squares, or not at all. Specific Destination. Some powers instead specify a destination, such as any square adjacent to you. No Opportunity Attacks. Forced movement does not provoke opportunity attacks. Valid Space. Forced movement ca’t move a target ontoa space it couldn’t enter by walking. To measure distance on a battle grid, simply count squares. You can move your speed in squares as a move action, in any direction, across squares or across diagonals. In general, you can’t move through an Occupied square. Ally. You can move through a square occupied by an ally. Enemy. You can’t move through an enemy’s space unless that enemy is helpless. Ending movement. You can’t end your movement in an occupied square unless it’s an ally’s square and the ally is prone, or it’s an enemy’s square and the enemy is helpless. Rubble, undergrowth, shallow bogs, steep stairs, and other types of difficult terrain hamper movement. It costs 1 additional square of movement to enter a square of difficult terrain. If you don’t have enough movement remaining, you can’t enter a square of difficult terrain. You can’t shift into a square of difficult terrain unless you have a power which allows you to do so. You can’t enter a square with an obstacle that fills that square, such as a wall or a pillar. When an obstacle fills a square, you can’t move diagonally across the corner of that square. Once per encounter, you can spend an Action Point. When you spend an action point, it’s gone. You earn more action points by adventuring. You start with 1 action point. After an Extended Rest, you lose any unspent action points, but you start fresh with 1 new Action Point. Most often, you spend an action point to take an extra action during your turn. You decide if the extra action is a standard action, a move action, or a minor action. Over the course of a battle, your character takes damage from attacks. Damage reduces your hit points. Maximum Hit Points. You have a maximum number of hit points, as determined by your class, level, and Constitution score. Your current hit points can’t exceed this number. Bloodied. When your current hit points drops to one-half your maximum hit points or lower, you are bloodied. Certain powers work only (or work better) against a bloodied target. Dying. When your current hit points drop to 0 or lower, you fall unconscious and are dying. Any damage you take continues to reduce your current hit points until your character dies. Death Saving Throw. When you are dying, you make a saving throw at the end of your turn each round. If you succeed (roll 10 or higher), there is no change in your condition. If you fail the save (roll lower than 10), you slip one step closer to death. If you fail three times, your character dies. Death. When you take damage that reduces your current hit points to a negative number that is the same as your bloodied number, or if you fail your death save three times, your character dies. Even as the battle rages around you, you can heal. You can heal yourself by using your Second Wind. An ally can use the Heal skill on you. An ally can use a healing Power on you. When a power heals you, you don’t have to take an Action to spend a healing surge. Even if you’re unconscious, the power uses your healing surge to restore hit points. And some powers don’t require you to spend a healing surge at all. If a player character is dying and receives healing, the PC goes to 0 hit points, and then regains hit points from there. As soon as the PC’s current hit point total is higher than 0, he or she becomes conscious and is no longer dying. Outside of encounters, you can take one of two types of rest: a short rest, or an extended rest. Short rest. A short rest allows you to renew your encounter powers, and use healing surges to regain hit points. It lasts about 5 minutes. You can take as many short rests in a day as you want. During short rests, you still have to rest; no strenuous activity, no interruptions. Extended rest. Once per day, you can take an extended rest. It must last at least 6 hours to gain the benefits. You have to rest or sleep during this period. At the end of the rest, you regain any hitpoints you have lost, and healing surges you have spent, and daily powers are renewed, and you lose any unspent action points. You gain 1 fresh action point. Skills are performed against a Difficulty Class (DC). Easy tasks have a DC of 15, moderate tasks have a DC of 20, and hard tasks have a DC of 25 or higher. While everybody may perform tasks related to a skill, some tasks require special training. Acrobatics. Use this skill to test your balance on narrow or unstable surfaces, to escape from a grab or from restraints, and (if you’re trained) to reduce your damage when you fall. Arcana. You have knowledge about magic and magical effects, and (if you’re trained) you know how to detect a persistent magical effect and identify rituals. Athletics. Use this skill to climb, swim, escape from a grab, or jump. Bluff. Use this skill to make what’s false appear to be true, fast-talk a guard, con a merchant, tell lies, or gain combat-advantage through feints, or create a diversion to hide. Diplomacy. Use this skill to influence others with tact and social grace, change opinions, inspire good will, and to negotiate a deal in good faith. Dungeoneering. You have knowledge about forging a path through a dungeon complex, recognizing dungeon hazards, and finding food in the Underdark. Heal. Use this skill to administer first aid, stabilize a dying character, grant a saving throw, or treat a disease. History. You have knowledge about history, including significant events, legends, customs, and traditions. Insight. Use this skill to discern intent and decipher body language, making a best guess as to a target’s motives, attitudes, and truthfulness; or to see through illusions. Intimidate. Use this skill to influence others through hostile actions and overt threats. Nature. You have knowledge related to finding your way through the wilderness, handling animals, recognizing natural hazards, and living off the land. Perception. Use this skill to notice clues, spot immediate dangers, and locate hidden objects. Religion. You have knowledge of religious traditions. Stealth. Use this skill to hide and move silently. Streetwise. You know how to get the lay of the land in an urban setting. Thievery. Use this skill to disable traps, open locks, pick pockets, and perform other sleights of hand.